Christmas invites us to focus on the sign of the Child and to recognise him in the faces of little children, especially those for whom, like Jesus, “there is no place in the inn”, Pope Francis told the faithful in his Urbi et Orbi address on Christmas morning. 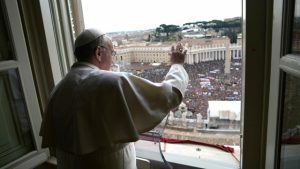 The Pontiff told a packed St Peter’s Square that, “as the winds of war are blowing in our world – an outdated model of development continues to produce human, societal and environmental decline”. He singled out tensions in the Middle East for special prayer, urging the faithful gathered in the Square below him to pray that the will to resume dialogue would prevail between the parties and that a negotiated solution could finally be reached, one that would allow the peaceful coexistence of two States within mutually agreed and internationally recognised borders. Pope Francis said that Jesus is seen in the faces of Syrian children still marked by the war that has caused so much bloodshed. He said Jesus was to be seen in the children of Iraq, wounded and torn by the conflicts the country has experienced over the last fifteen years, and in the children of Yemen, where there is an ongoing conflict that has been largely forgotten, with serious humanitarian implications for its people, who suffer from hunger and the spread of diseases. “We see Jesus in the children of Africa, especially those who are suffering in South Sudan, Somalia, Burundi, Democratic Republic of Congo, Central African Republic and Nigeria,” the Pope said. He also entrusted Venezuela to the care of the Infant Jesus in the hope that it would resume a “serene dialogue among the various elements of society for the benefit of all the beloved Venezuelan people”. The Pope also prayed for those affected by the conflict in Ukraine and unemployed parents who struggle to offer their children a secure and peaceful future and those whose childhood has been robbed and who, from a very young age, have been forced to work or to be enrolled as soldiers by unscrupulous mercenaries. “I see Jesus again in the children I met during my recent visit to Myanmar and Bangladesh, and it is my hope that the international community will not cease to work to ensure that the dignity of the minority groups present in the region is adequately protected,” the Pontiff said in a veiled reference to the Rohingya Muslims but also other ethnic groups such as the Kachin Christians.